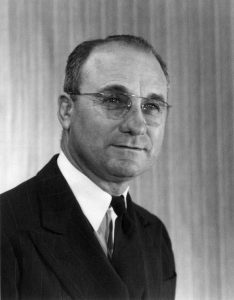 Dr. R.A. Stirton, “Stirt,” as he preferred to be called, was born on a farm near Muscotah, Kansas, August 20, 1901. He studied zoology at the University of Kansas where he was also a varsity wrestler. He was the mammalogist on the Donald R. Dickey expeditions to El Salvador in 1925 and 1927, and then came to Berkeley as a graduate student assistant to William Diller Matthew. At Kansas, and later at Berkeley under the guidance of Professors Joseph Grinnell and W.D. Matthew, he came to appreciate the importance of meticulous field notes, specimen labels, and museum catalogues. In 1930 Stirton was made Curator of Fossil Mammals in the Museum of Paleontology. He began teaching the course on fossil mammals in the 1930s, was appointed Lecturer in Paleontology in 1941, and then Associate Professor in 1946. 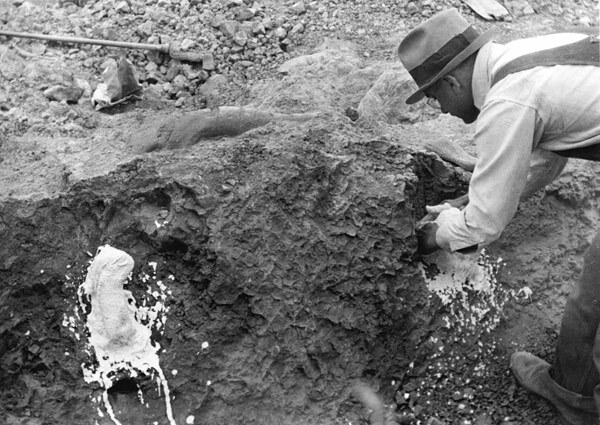 Stirt became Director of the Museum of Paleontology in 1949 (serving through 1966), was promoted to Professor two years later, and served as chairman of the Paleontology Department from 1951 to 1956. Though accepting the responsibilities of both Chair and Director, his lectures remained popular and lively. Former students may well remember his rendition of the call of Australia’s dingo in Paleo 1 lectures. Stirton’s early work was on Tertiary mammals from the Great Plains and western United States. He published important studies on fossil beavers, horses, the evolution of hypsodonty, and the value of vertebrate faunas in stratigraphic correlation. A deep interest in biogeography underlay his later research programs and also motivated graduate seminars. With financial support from Miss Annie Alexander, Stirt returned to El Salvador in 1941-42 to collect Recent and fossil mammals for the Museum of Vertebrate Zoology and UCMP. Two years later, with a Guggenheim Fellowship, he set out to search for fossil mammals in Colombia. A fire on the ship destroyed all his equipment, but with assistance from the Tropical Oil Company and Colombian government, he was able to continue the expedition and discovered the La Venta fauna — the first major mid-Tertiary mammalian fauna found in tropical South America. Continuing a longtime interest in marsupials, Stirton shifted his collecting efforts to Australia in 1953. Working in cooperation with the South Australian Museum, Stirton discovered a succession of Tertiary faunas including primitive members of several marsupial families. Stirton brought several Australian students to Berkeley for advanced study. During the 1960s and later, this collaborative project was continued by R. Tedford and M.O. Woodburne and several Australian colleagues. Stirton’s important scientific contributions are the careful descriptions and systematic analyses of fossil material, including precise determination of its geological occurrence; use of faunal assemblages for stratigraphic correlation; and studies of evolutionary changes in morphology of various mammalian lineages. Stirton died of a heart attack while attending a southern California meeting of the American Society of Mammalogists on June 14, 1966. From the May 1997 UCMP News newsletter; some minor additions by Dave Smith, 2008.